Oh, the whole thing is 43 words if you add the second section that gave Congress the power to enforce the first section. But it was those first 32 words that meant so much. And they changed the country, forever, for the better. Slavery arrived in what became the United States when a ship called the White Lion arrived in Virginia in August, 1619.2 It took a war and an amendment to the Constitution to bring it to a close. 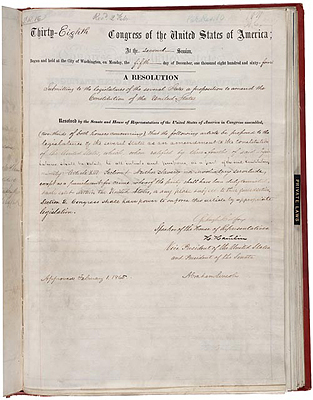 How Illinois was the first of the states to ratify the proposed amendment, voting on the first of February, followed the next day by Rhode Island, and the day after that by Michigan, Maryland, New York, Pennsylvania and West Virginia.10 How the number of states kept growing through the early months … and then stalled. And those critical 32 words became the law of the land. From a genealogical standpoint, this is a high watermark day. Individuals who had been little more than tick marks on a slave census, or first names in a property list, gained legal recognition as full legal persons — and records began to be created in their own names, rather than in the names of slaveholders. Vast numbers of newly freed Americans — and of equally vast numbers of whites with whom they came into contact, from former owners to employees of the Bureau itself — were recorded in the documents of the Freedmen’s Bureau. And, with a little help from our friends, we can all use them and access them much more easily down the road than we can in the hundreds and hundreds of rolls of microfilm and unindexed digital versions where they reside today. Because there’s a whole indexing project going on that we can join and benefit from. Head on over to The Freedmen’s Bureau Project — just click on that link, and be prepared to be drawn in to one of the most fascinating sets of records you will ever work with. It’s a cooperative venture between FamilySearch International and the National Archives and Records Administration (NARA), the Smithsonian National Museum of African American History and Culture, the Afro-American Historical and Genealogical Society (AAHGS), and the California African American Museum. And to make these amazing records really searchable online, it needs all of us to pitch in with whatever time we can give — even a few minutes. One hundred and fifty years of freedom. One amazing set of records documenting an historical time of change and growth. Just waiting for us to help out … and make everyone’s history accessible.